With the spring semester coming to an end, UNM Parking and Transportation Services (PATS) has announced the annual closure of South Lot. Beginning this Friday, April 29 at 7 p.m., South Lot will be closed to permit holders through the end of the semester and throughout the summer. Regular service for South Lot will resume at 6:30 a.m. on Monday, Aug. 22, 2016. 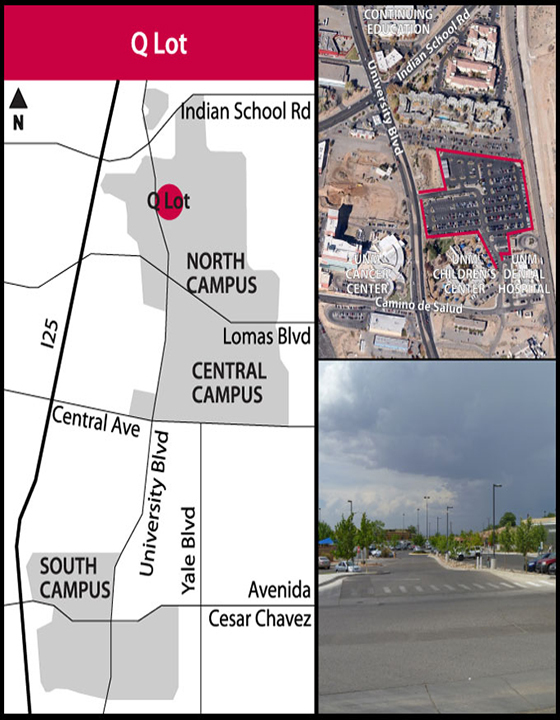 Permits for South Lot will be honored in Q Lot—south of Indian School Rd.—where shuttle service will continue throughout the summer. South Lot permits will also be honored in A, B and C lots in compliance with the 3:45 Rule. Everyday at 3:45 p.m. all Park & Ride and preferred permits become valid in any other Park & Ride and preferred permit lot with the exception of parking structures, pay stations and GR/R/Lomas residence lots. Additionally, the evening flat rate option is available in both Yale and Cornell parking structures from 3 p.m. to midnight for $5 per use. Hourly rate options are also available in the structures. The annual closure of South Lot is a week earlier this year due to the NMAA State Track and Field Championship held annually at UNM’s Track and Field Stadium. Shuttle service for SSSC/Lobo Village will be reduced for the summer semester beginning Monday, May 16 through August 19, 2016. The shuttle will visit the Yale Mall and SSSC/Research stops approximately every 20 minutes and the Lobo Village stop approximately every 40 minutes. The last shuttle will depart from Yale Mall at 6:50 p.m. daily. Visit PATS website for the full daily schedule and to get more information on alternative parking options. For more information, contact UNM Parking & Transportation at 505-277-0850 or visit the PATS website.